I went back to see the COC’s Louis Riel again on Friday evening. Unlike opening night I wasn’t all keyed up to see whether Peter Hinton’s production “worked”. I knew it did. I think, too, perhaps the cast were less nervy and had settled into the show. In any event it allowed me to see the show in some different ways though I suspect that to fully unpack it would take a couple more viewings. It’s more than a crying shame that there will be no video recording, unlike 1969. In fact it’s a damning indictment of successive Canadian governments and the CBC. What follows isn’t intended as an exhaustive analysis or review. Rather it’s a few thoughts that have been percolating. 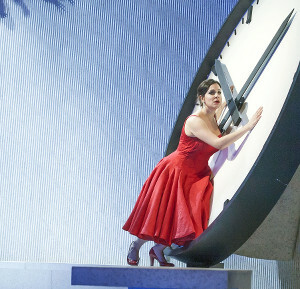 Last night we saw the last performance of the current COC run of La Traviata, this time with the alternate cast. Joyce El-Khoury, Andrew Haji and James Westman came in for Ekaterina Siurina, Charles Castronovo and Quinn Kelsey. We were also sitting in Ring 3 rather than lower down which gave a rather different perspective; perhaps not showing off the clever lighting for the intimate scenes quite as well but much more effective, by giving greater depth, for the party scenes.